Experience teaches us that the contents of the Public Test Server swiftly fall, almost without exception, into the real world of SWTOR. And so again the PTS has given us a glimpse of the game’s near-future – a future featuring Heroic Space Missions and a new PvP Warzone in 1.6. The Warzone introduces a new PvP set-up, which sees Republic and Imperial forces at odds over two objective points – volatile energy pylons. Control the pylons and fell enemies to discharge energy into your faction’s portal. Continue to do so and the portal will open, spilling reinforcements and spelling victory. In addition, there are six new repeatable Level 50+ Heroic Mode Missions per faction, designed to “challenge even the most skilled pilots”. Rewards will include high level gear and Black Hole Commendations to spend on ship upgrades. BioWare write that all Warzone matches on the PTS have automatically been set to Ancient Hypergate for the occasion. 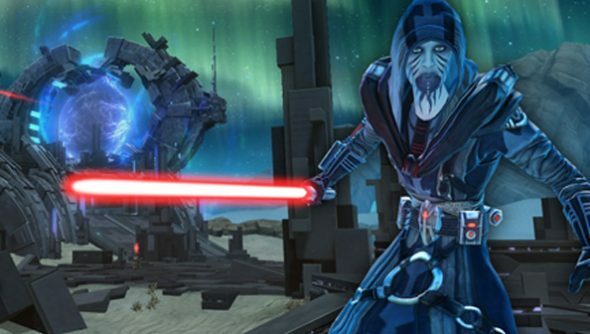 This is mostly new high-level stuff – nothing to concern SWTOR’s new free-to-players. Where do you think BioWare should be focusing their attention right now?